Diller Teen Fellows of cohort nine celebrate their graduation. Brandon Roberts of Livingston was one of 20 Greater MetroWest Diller Teen Fellows who gathered with family and friends on Dec. 13 to celebrate the culmination of the 15-month leadership development program. The graduates of cohort nine, representing a variety of towns, denominations, and backgrounds, include Noah Atlas, Julia Balick, Aylon Berger, Rachel Breslau, Liat David, Emily Kanter, Deni Kaplun, Rebecca Landau, Aryeh Lande, Ben Leit, Lauren Mensch, Jonathan Nulman, Lauren Plattman, Brandon Roberts, Sam Russo, Ruby Schechner, Eran Shapiro, Leora Shua, Daniel Sokolin, and Judah Ullman. 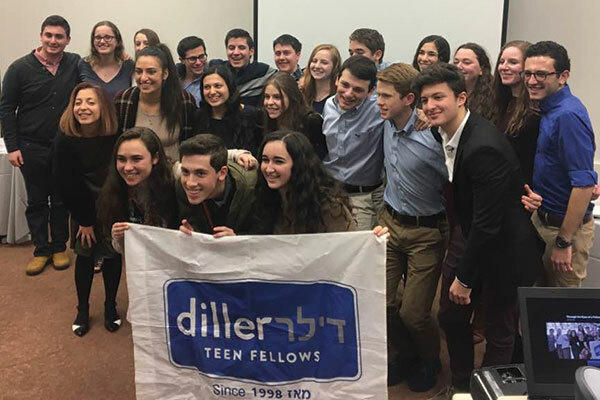 The past 15 months as a Diller Teen Fellow have been one of the most meaningful journeys of my life. It has afforded me opportunities for change and growth that would have not been possible without the guidance and support of its quintessential leaders. The skills and lessons I have taken away from our monthly workshops and Shabbatons have given me invaluable experiences that will propel me forward during my college years and beyond. Before Diller I had very little interest in politics and international affairs, but now I see politics as a platform for change, and hope some day I can play an active role in repairing the world. Diller even provided me the opportunity to attend my first American Israel Public Affairs Committee conference in Washington, DC, where I advocated for the issues that mean so much to me. One of my fondest memories of this past year was when we hosted our partnership cohort from Rishon Letzion. We had a blast showing them New York City and Philadelphia, taking them to our high schools, and giving them a taste of what it is like to be an American teen. I grew especially close to my own guest, Ofir. We spent hours talking about the presidential election and Israeli politics, and spent a great deal of time at Best Buy purchasing video games and electronics (they are less expensive here). The most exciting part of the Diller program was my first trip to Israel; traveling with my cohort made my trip meaningful. For one week I lived with Ofir and his family, saw the sights of the country that I have always dreamed of seeing, and engaged in intensive and interesting programming. The culmination of the trip was the International Congress, where I met hundreds of other Diller Teen Fellows from around the globe. There, I saw the true meaning of Jewish peoplehood. I was so inspired to hear different accents, yet realized the stories were very much the same. I was given the opportunity to address the entire congress on behalf of the American Diller Fellows. This was such a great accomplishment and honor for me. The Diller organization says that in 15 months leaders are developed, communities are transformed, and there is hope for a better world. How true it is. Its pillars of leadership, tikun olam, Israel, and Jewish identity are values I will take with me far beyond my graduation. Looking back, I applied to the program because I was told it would be a life-changing adventure, and indeed it has been just that. I will be forever grateful to the Helen Diller Family Foundation and the Jewish Federation of Greater MetroWest NJ for bringing out the very best in me. I remain a very proud Diller Teen Fellow now and forever.